Chris Crutcher Archives - Book.Blog.Bake. 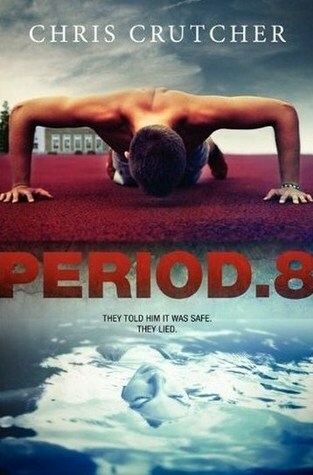 I feel like there were two competing story lines in Period 8. There’s the events of the actual Period 8, a lunchtime get together of a jumble of high school students from different backgrounds, social groups, and grade levels. They’re led by Logs, the supportive teacher who leads what, in essence, becomes a high school therapy group. No topic is off-limits in Period 8, but everything remains confidential. There’s quite a few scenes that take place in Period 8, and they all felt overly dramatic to me. It was a lot like watching a high school soap opera, and these scenes were by far my least favorite part of the book. While I do appreciate the idea of the listening, caring teacher who actually gets his students and supports them both in and out of class, the way the book reads seems just a little. . . off. I think it might be because we never really see the build-up to Period 8, instead there’s just a mess of characters all talking to each other about things that don’t seem like would normally be discussed so easily. Also, there’s a strong attempt to create a realistic teenage dialogue in this book, and while I think Chris Crutcher gets it better than most, it still feels a little stilted. That’s story line A. Then, we have story line B, which is where the psychopathic bully comes in. I enjoyed this story line much more, because while it may not have been exactly realistic, the action didn’t feel forced and I really enjoyed the pacing. If there had been slightly more of a focus on what was actually going on and less of the conversations in Period 8, this book would have ended up with a much higher rating from me. Even though it’s pretty easy to spot the initial bully the first time he’s introduced, there’s quite a few plot twists that I didn’t see coming. The ending was left me reeling a little bit and I definitely had to read the last few pages again. Unfortunately, this book does use one of my least favorite tropes– the informed character trait. We’re told Paulie is a good guy and great teenager by dialogue from other people before we ever get to see it. And while in this case the informed trait may actually be true, unlike some books, I still feel a little letdown whenever someone’s character is introduced to me through dialogue. It’s a minor thing in this book, but enough that I noticed it. Ultimately, I did end up enjoying Period 8 more than I thought I would, but there are definitely some aspects of the book that didn’t quite do it for me. Final Impression: There were two main story lines in Period 8, one of which I really disliked and one that I enjoyed immensely. As a result, I have a few mixed feelings on this book. There were a few things that annoyed me, such as the informed character trait and the forced teenage dialogue, but the twists towards the end were excellently done and this book definitely ended on a positive impression. 3/5 stars. You can find Period 8 on Amazon or Barnes and Nobles.